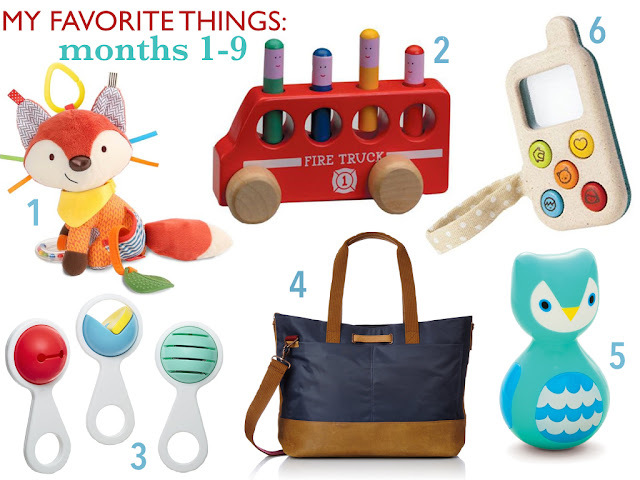 I have not done a favorites list for baby #2 items since the newborn phase! Obviously, I'm on top of things. But recommendations from other moms are my favorite posts; especially when they include the best of the best! Not all these things are going to be used in this wide age range of 1-9 months, but that's the gap of time I left myself with. So use your best judgement! 1. Bandana Buddy: I actually think Erin recommended this. And I always trust her. Not only is this the most adorable thing ever, but babies love it! It crinkles, it shakes, there are tags, teething parts, and a soft cushy stuffy. The fox is by far the cutest, but we also have the kitty which is a good runner up. I have one for the car and one for home! 2. Pop-Up Firetruck: Maybe one of my favorite wooden toys ever! There are springs below the little pegs, which make them jump out when you hit them down. Finn mostly just likes to hoard the pegs in his hands and chew on them. Liam loves it too, so this toy is awesome for all ages! There is also a school bus model. I have Natasha to thank for this find! 3. Kid O Music Set: Finn loves rattles. It's such a stereotypical baby toy, but he is into them! These little instruments are perfect. He'll carry one around anywhere. Liam & I also join in on the fun during dance parties. 4. Timbuk 2 Bag: This is not a diaper bag, but I use it as one. I was gifted this bag by my in-laws and fell right in love. I wasn't in the market for a new bag, but once it was mine I immediately donated my old bag. It is thee perfect size (we cloth diaper FYI), and it doesn't scream diaper bag so Conor won't moan & groan about carrying it too! I have already traveled with it and again, LOVE! 5. Kid O Wobble: I obviously went for the adorable factor here. But it's also Finn approved. It's easy for his little hands to grab, and he smiles like crazy watching it wobble. It's really small, so this toy is always in my diaper bag for whenever I need a little distraction for Finn. 6. Again, adorable but also functional. Finn likes to mess with the buttons and the handle. While Liam uses it for pretend play. It's small enough to stay in my diaper bag at all times too. I love toys that will work for both boys now and will grow with Finn. Plus, there is nothing cuter than placing multiple calls to our cats at home. That is a go-to restaurant activity! So with Easter & Finn's birthday right around the corner, tell me... What are your one year olds loving?! I haven't seen most of those toys, but I love them! One of our favorite is Sophie the Giraffe. She's expensive, but when it comes to teething so she very worth it. Both of mine have loved a V-tech phone that counts. The fire truck and cell phone are sooooooooo cute. okay obviously not pregnant or whatever, but love this! that bag is great. have you ever done a diaper bag post? i know that seems random especially from me with no babies etc but you know i want to cloth diaper and everyone i know that has cloth diapered struggles with the diaper bag, unless they get a petunia or jubebe whatever and i can't afford those! i mean, i could, but i want something that i can use for a long time or that KC can use and those prints scream baby bag. anyway. this is way too much of an opinion / question for someone who is not pregnant haha. we love all of these!! the bandana buddies were fav's of k's! and the rolling guys are SO cute (they might be more MY favorite? either way!). Your non-diaper diaper bag is great! I love it! The bandana buddy is so cute!! Adding some of these to my baby registry which seriously needs help - thank you! I adore wooden toys, I want to check out the school bus! I love seeing your toy ideas because they always seem to be unique and creative ones. Great picks! All so cute. Love wooden toys....the plastic ones that make all the noises are certainly jazzy but I just think the simple ones are so much better. That fox!!! If I need to buy a baby shower present, I'm all about that! SO CUTE! I need number 3 and 6 in my life. I'm positive Julia would love them both! These are great! I haven't seen a few of them, so I just added them to my cart! :) Thanks for sharing!! cute.. when my eldest was one he loved this music cube we used to have. Oh, love that little firetruck! And that fox is adorable! Now I just need another baby! These toys are awesome! And with Easter and birthdays just around the corner....I might have to hook a baby girl up!